When blues-rock kingpin Joe Bonamassa last spoke with MusicRadar, he was pleased as punch at the album he had just recorded with Black Country (now changed to Black Country Communion due to copyright issues) the prestigiously pedigreed outfit that also includes former Trapeze/Deep Purple bassist and singer Glenn Hughes, drummer Jason Bonham and ex-Dream Theater keyboardist Derek Sherinian. "This is a flat-out rock thing for me," he said. "There's very little blues going here. We're all about rocking, and I've been having a blast." Now that the group's debut, Black Country, has been released, Bonamassa is more pumped than ever. "Do I see this as my Blind Faith or Cream? Absolutely," he says. "I'm not saying we're as good as those groups. I'd be an idiot to compare myself to Clapton in any capacity. But I like how he would veer from the blues and get into other types of bands and music. That's how I view this opportunity with Black Country. It's my supergroup, for lack of a better term - a chance to stretch out with some killer players who just happen to have some big names." Literally thrown together by Bonamassa's longtime producer Kevin Shirley, the Black Country Communion guys hunkered down and slammed a record down in a week's time, and the result is a potent and stomping collection of riff-heavy rockers (with just a touch of funk and prog) that will undoubtedly stun listeners who only know Bonamassa from his blues offerings. From the breakneck pace of the title track to the surging power of Medusa (that's Hughes dipping back into his Trapeze catalogue), the playing is energetic, the vocals (Hughes sings the majority, with Bonamassa taking lead on only two cuts) are expressive, and the overall vibe is joyous. "If people have a great time listening to it, then mission accomplished," says Bonamassa. "Despite the crazy way it all came about, with Kevin Shirley putting us in a room and basically saying, 'You're a band,' we had the time of our lives." In the following interview with MusicRadar, Joe Bonamassa discusses the unorthodox recording of Black Country, his radically new guitar sound and what the future holds for rock's newest supergroup. 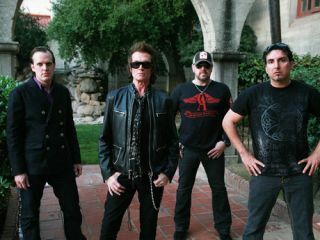 Black Country Communion recorded their debut quite quickly, in seven days, in fact. Why the rush? "The long and the short answer to that is, everybody was busy, and seven days is what fit into our schedules. You know, when you think 'supergroup,' you have this image of limo drivers being late to pick up the other limo drivers. [laughs] That wasn't the case with us. "We didn't know what we were going to get out of this. It could have turned into what it is, which is a great record, or it could have been, 'Wow, glad we didn't spend a lot of money doing that.' [laughs] But that's kind of the way I like to work. I can't speak for the rest of the guys, but I like to work quick and dirty. I don't want to spend a lot of time wondering if the songs are right. I don't want to spend a lot of time worrying about the solos. I just want to go in and react, you know? "To me, classic rock or blues-based music all comes down to players reacting off one another. That's where the passion is. Kevin and I have worked like that for six years, so we felt right at home running the band like that. He'd say 'go,' and we'd play, or I'd bust out a solo, and I'd look at him and say, 'Did we get it.?' And if he said it sounded cool, I was like, 'Great. We're on to the next thing.' This kind of music is all about spontaneous energy. If you're not capturing that, you're not getting it." Even though this was Kevin's brainchild, once you guys found yourselves in a room, what was the first step? Did you prepare demos? "Nope. No demos. They were more like sketches for some of the songs. I have the stuff that Glenn and I put down on GarageBand on my computer, but I wouldn't call them demos per se. I didn't even have a real microphone; we used the mic on my computer for the vocal melodies. So they were real rough, believe me. When we walked in the studio, these were bits and bobs of songs. When we were trying to figure out the songs as a band, I kept pressing buttons on my computer, going, 'I can't remember what we did here. Give me a minute, guys.' It was crazy. "But it was fun, too. We started to develop a real 'screw it' attitude, kind of the way I imagine Beck-Ola and the early Zeppelin stuff was recorded. It was like, 'OK, you're Jason Bonahm. You're Glenn Hughes. You're Derek Sherinian. And you…you're some bozo with a guitar. Do something!' [laughs] Once we got into that mindset, things started flowing." A producer can put technically proficient players together and know he's going to get a certain kind of music, but that doesn't mean he's going to get a band. When did you guys know you had truly gelled, not just musically but personally? "I think it came from Jason's very first downbeat. When we first heard that, we knew, 'All right. We want to be hearing that all day long.' Seriously, though, we all have very healthy egos, but none of this went into this trying to be the king, you know? We all wanted to make cool music and see if we could be a band. That was definitely the idea. We've talked about this before, but I'm still floored at how different you sound on this album. Your guitar tone is quite unlike anything you've gotten in the past - it's super heavy. "Yeah, it's amazing what a couple of Marshalls, two Starbucks and two Red Bulls will do to you. [laughs] It was a lot of fun to get some different sounds going. I had a different kind of rig than I usually use. I had a Marshall Jubilee and Super Bass, a Tube Screamer, a wah, delay and a flanger, and that was it. For guitars, I got to use a '68 Custom Les Paul that belonged to Mel Galley - he was in Trapeze with Glenn. I was pretty careful when playing that guitar. Then I used a few of my signature Les Pauls, plus an Explorer. I didn't go crazy with gear and guitars - there was no time. "Beyond the instruments, though, there's a headspace that you have to get into to play real rock. I'm a student of rock - of music in general - and I'm able to find different sides to my personality, and before you know it, they're coming out of an amp. I know people have an idea of me as just being a blues guitarist, and I certainly love the blues and will always play it, but I've always been into total heavy freakin' rock music, too." That's pretty apparent on the album's title track, which is almost speed metal meets Led Zeppelin. "It does sound like that, doesn't it? That opening riff is something I came up with and Glenn latched onto it. 'What is that?' he said. 'I've gotta play that riff!' And so he starts out the riff on the bass, which I just love. How many albums start out with a bass? I can't think of one right now. Maybe Motorhead." We talked about this in a previous interview, too, but I want to expand on something: When you play with Jason Bonham, hearing that right foot of his on the bass drum, does it make you as a guitarist attack your instrument in a heavier fashion? "Yes. Absolutely. As a guitarist, I find my intensity level is totally ruled by the drums. I could be the most disciplined Joe Pass jazz guy, and if Jason Bonham started playing drums behind me, I'd metal out. [laughs] He brings out the energy and fire in everybody, and you have to be ready when he unleashes." Aside from using different gear, did you do anything else to get into a different headspace for this record? Did you pull out old rock albums? "I really didn't need to. When I was a kid, I listened to everybody, and I took a little bit from everybody. Dave Murray and Adrian Smith from Iron Maiden, Tommy Bolin, Bill Nelson from Be Bop Deluxe, Jimmy Page, Tony Iommi, Gary Moore from his Thin Lizzy era - those are the guys that I was thinking of when I walked into the room to make this record. So I didn't have to sit down and study them again; they're already in my head." Although you only sing lead on a couple of cuts, there's a difference to the timbre of your voice, too. It's rather sweet, which blends nicely with the rough, raw edge of Glenn's voice. "We do play off each other, which is what two singers should do. Why have two guys who sound the same? That would be pointless. I'll tell you, though, initially I turned down the offer to sing anything. I just wanted to be the guitar player in the band. But Kevin and Glenn kept pushing me to sing, so I said, 'OK, fine, but only on a couple of cuts.' For things like Song Of Yesterday and The Revolution In Me, my voice works fine - I could even picture those songs being on one of my solo records. But for the really rockin' stuff, that's Glenn's area for the vocals. I can't compete with him." You might be tired of the comparisons, but the strings on Song Of Yesterday…they sound a little Zeppelin-y. [laughs] "They do. Sure, I accept that. A guy named Jeff Bova did the programming on that. He's done the string arranging on a few of my solo records. The guy's great. Does it sound a little Zeppelin? Hey…like there's worse things, you know? I mean, you've got Jason Bonham in the room, the song has certain feel…I can't run away from that kind of thing. I just embrace it." What's the overall plan for band? Your schedules are still pretty busy, do you think you can give the group the kind of commitment that's necessary? "Yeah, I do. We're doing a bunch of one-off shows, and after Jason does his Zeppelin Experience and the rest of us do some other things, we're planning an actual tour for 2011. Before that, however, I think we might go in and record a second album." What, you found two days free, so you decided, "That's enough time to do another record"? [laughs] "Something like that. I admit, it's a different approach, but we're an unconventional band."